During a time where our world seems constantly divided, our very own Kyu Hahn shares his encounter with seeing God present on both sides of a big issue and calls us all to seek justice and mercy for the most vulnerable in our world. January 9th, 2017, I was sitting in a courtroom in Tucson, Arizona, with eleven other, students, witnessing the reality and consequences of illegal immigration. This was a part of my seminary’s 10-day intercultural immersion trip to the Mexican border, and I was instantly overwhelmed by the weight of intensity that filled the space. 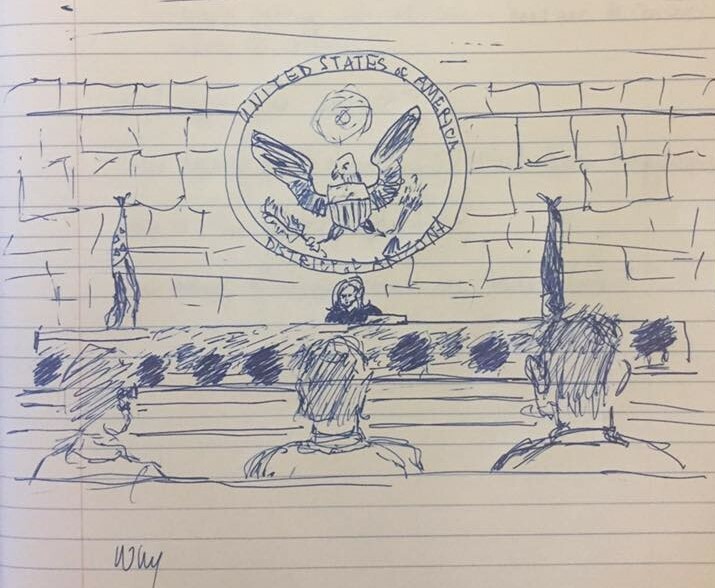 Drawn by one of the seminarians, Holly Teitsma, during the court session. Towards the end of one of the sessions, one man from Mexico wouldn’t leave the stand after being sentenced to 90 days in prison. He anxiously and desperately communicated to the interpreter, the interpreter translating to the judge, “Your honor, is there any way in which my time in prison can be reduced? I have a wife and four children that depend on me.” The judge politely explained that there was nothing she could do and the man was escorted out. It is inevitable, yet, also deeply heart-wrenching that there is no space for his story— his family’s pain and suffering—to be protected within the U.S. judicial system. There was a burning fire within me when everyone had left the room. Anger. Sadness. Frustration. Yet, by the grace of God, we didn’t walk out of the court consumed by those feelings. After the session, our group was given ten minutes to talk to the judge who had presided over the court cases that day. The judge was kind and humble. She loves her country and serves its people to the best of her capacity. “It is emotionally draining and very stressful. But, I’m doing whatever it takes, in the position I’ve been given, to protect the dignity of these people” she said. My mind was quick to judge the oppressive system and I was fast to blame those that are participating in the system. Yet, hearing the story from her heart, my anger melted in a mysterious way. How? Why? Because, even in the midst of such an oppressive reality, God was ever so faithfully present. He manifested his abounding grace through the judge who, with a consistent smile and genuine eye contact, kindly interacted with every single migrant throughout the two-hour session. God was present in that courtroom. He extended his hospitality through an attorney who at the end of session walked up to and warmly hugged all of her defendants. He revealed his love through border patrols agents who shared their personal snacks and water with those caught in the process of illegal crossing as they transferred them to the court. In a world that is swirling with various political opinions and agendas, this experience put names and faces to the immigrants who are struggling daily to survive and the American officials who bear the weight of delivering guilty sentence after guilty sentence. It is hard not to feel frustrated by the state of our helplessness in a system that seems so large and overwhelming. Friends, in this season of Epiphany, our Lord, Christ Jesus, reminds us that God is faithfully present in our world and that his kingdom reigns. Let us open our eyes, not only to see the things that we already know to be true, but to perceive what God might be revealing to us in and through events regarding immigration. Let us use our words, not as a way to judge those whom contradict our beliefs, but as a way to confess our helplessness and ask for God’s mercy and guidance. Let us open our hearts, not only to love those close to us, but to ceaselessly attempt to love those that we regard as enemies. If you want to join us in embracing Epiphany, here are some things to reflect on and challenge yourself with this season. Have you had an experience like this that showed you someone else’s perspective? How can we engage in conversations with those who might have different beliefs than us? How do you feel God working in your life to care for those who are most vulnerable? Kyu, thank you for sharing this story about a subject that has been heavy on the hearts and minds of so many. Thanks, Kyu! Yes, may our eyes be really open! My word for the year…”Seek”…as in continually seek God and to see God. Requires my action. Kyu, your insight shows grace, maturity and God’s love and mercy. So beautifully written on a most difficult and sensitive reality. Thank you for sharing.